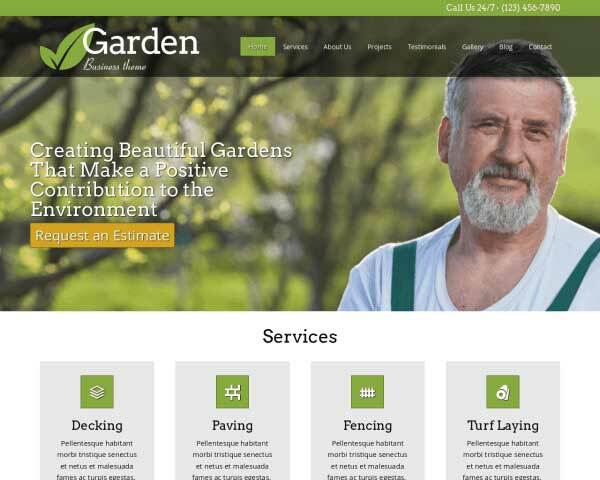 A good portion of our time and effort have been spent to make the best WordPress theme for lawn care companies that money can buy. 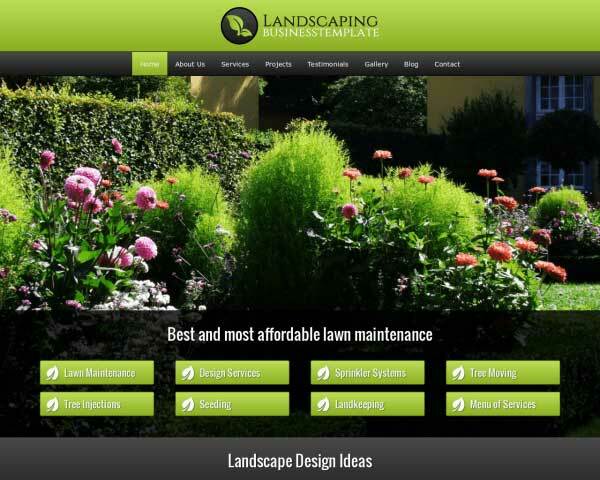 We think that this theme should be the basis for any lawn care website out there but let you be the judge of that. 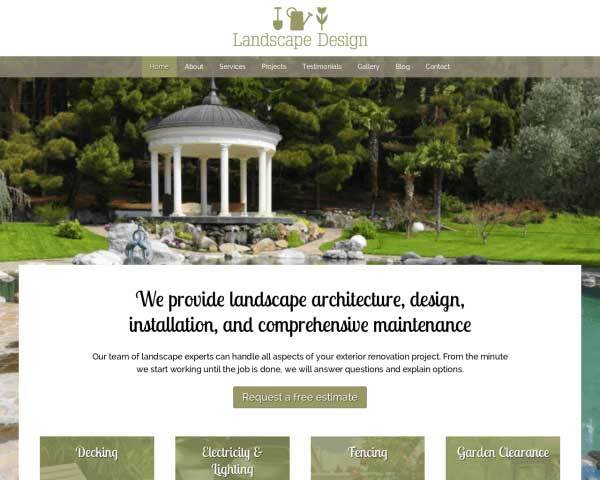 lawn care professionals looking for a rock-solid online solution to build a website have to look no further. With the Lawn Care WordPress Theme their search will end. It's a combination of a dazzling design, coupled with the most advanced user interface known to man all packed in a fully responsive package. Our sleek responsive design ensures that your site will project professionalism even on small screens. 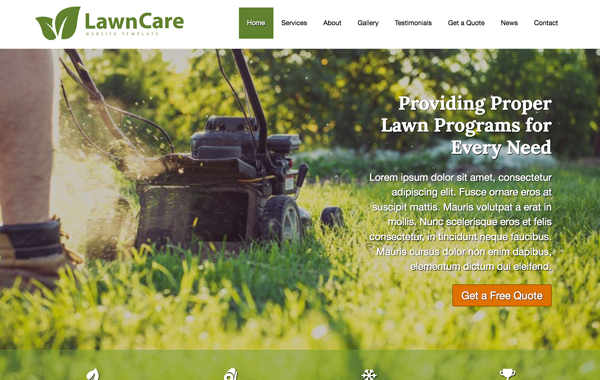 The Lawn Care WordPress Theme is a quick, affordable way to attract new clients with an informative website, even if you've never built a website before. 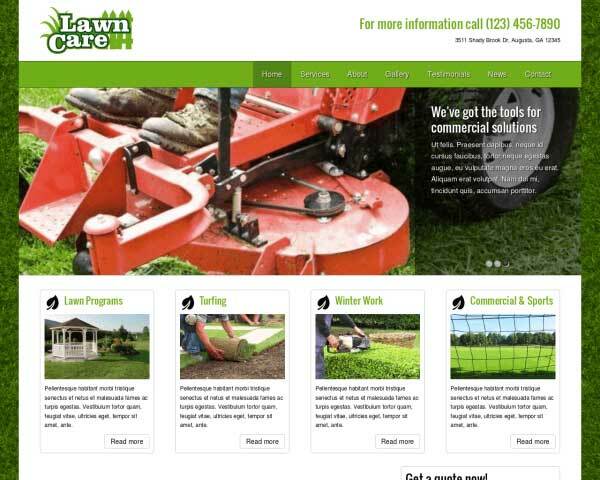 The Lawn Care WordPress Theme features a blog section to share tips, news and articles. We've even included a few sample posts to get you started. Great-looking design isn't reserved for the homepage. Individual pages where you can go into more detail about your services show are set up and ready for your own text and photos. 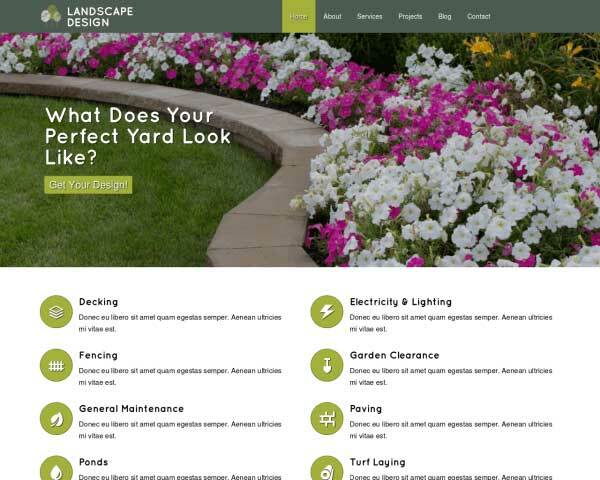 On every page of this WordPress theme for lawn care specialists, visitors are encouraged to take action and get in touch. Mobile visitors can just tap on your phone number to dial. The contact page on the Lawn Care WordPress Theme includes space for your contact details plus an integrated Google map, route planner and built-in form. 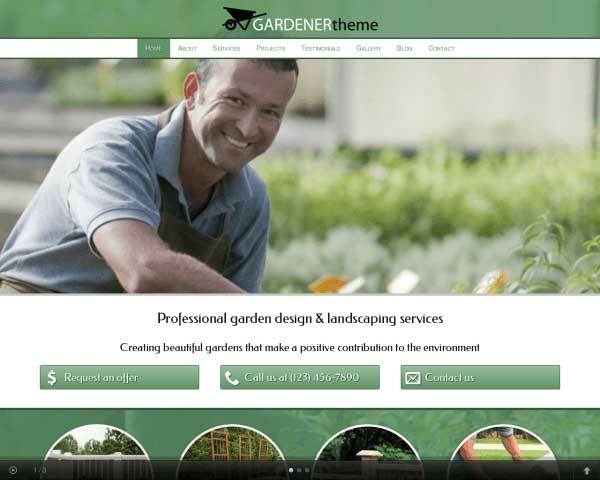 We've done extensive research to find out what makes a great garden website in order to ensure that the Lawn Care WordPress Theme offers the best match for your needs. A great way to provide valuable leads is by letting potential interested visitors fill in a free estimate form. Each submitted form is stored on your server for future reference. 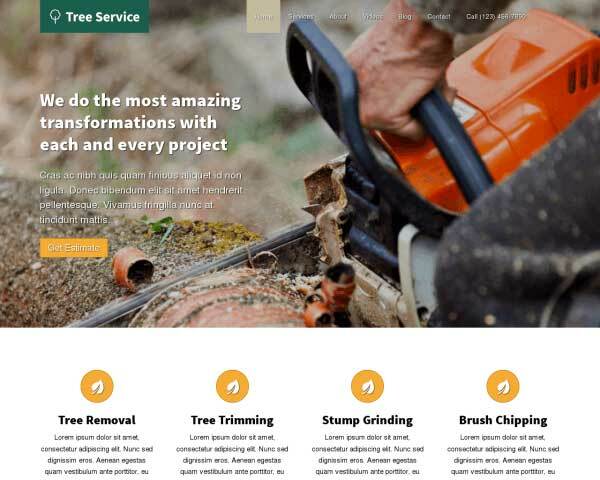 Included with the Lawn Care WordPress Theme are icons for the most popular social media platforms, allowing visitors to simply click to follow you online or share your content on their pages. 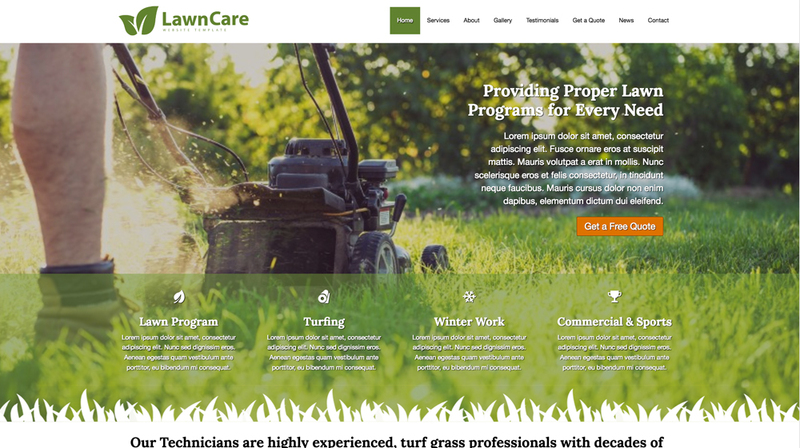 With a simple, clean design that lets your own work shine through, the Lawn Care WordPress Theme is set up to help you get a great-looking, efficient website online fast. Feature your best photos by adding an image gallery to any page on the Lawn Care WordPress Theme. Clicking on any thumbnail opens the photo in an elegant lightbox slideshow. 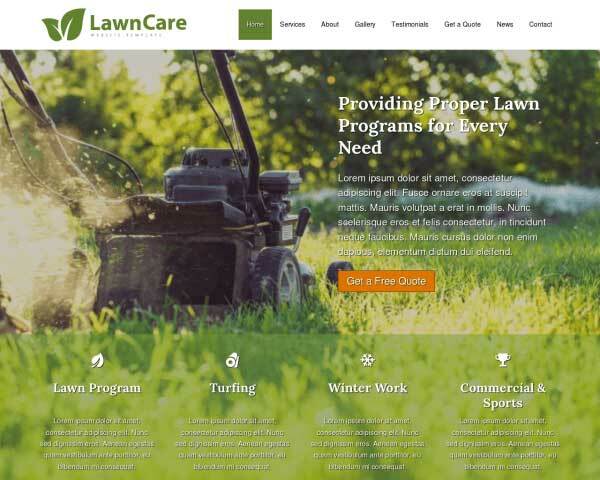 Offer an attractive overview of your services on the homepage of the Lawn Care WordPress Theme, along with quick navigation to important pages on your website. 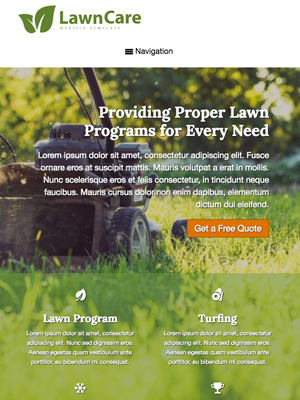 Attractively display client feedback with the Lawn Care WordPress Theme's quote widget. Just paste in your own text and the quotes will be automatically styled with no coding required. These days people browse online using many different types of mobile devices, and websites must be mobile-optimized to look great on any device. That's why we've built the Lawn Care WordPress Theme to be fully responsive, automatically adapting the layout of your photography portfolio to any size screen while keeping navigation simple and user-friendly. Our sleek mobile design ensures that visitors will enjoy the same professional look and full-page photos of the desktop version when viewing your site on their phone or tablet.